Highest quality marine grade stainless steel cable from 1mm diameter to 12mm diameter. Available to buy per metre or as 100m or 250m reels. Please click here to see our trade reel prices. Please note the minimum length you can order is 1 metre, simply enter the length you need. Product has quoted safe working load. The flexible 7x7 construction stainless steel wire rope is less strong but more flexible than 1x19 strand and yet stronger than 7x19 rope. 7x7 A4 AISI 316 grade stainless steel cable is suitable for tensioning, security cables, marine, landscape and architectural use, stainless cable balustrading, stainless steel cable railing and decorative applications. 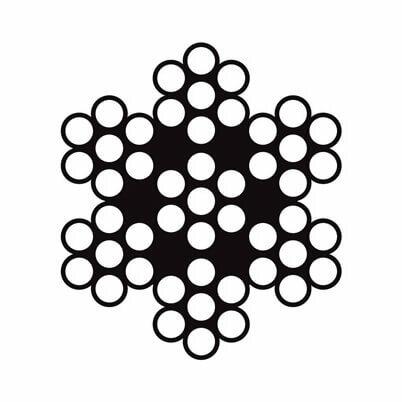 Cable diameters below 2mm are very flexible. 7x7 Stainless Steel Wire Rope - Demonstration of the characteristics of 7x7 stainless steel wire rope. Medium strength and flexibilty. MBL - Minimum Break Load = The stress which, when steadily applied to a structural member, is just sufficient to break or rupture it. Also known as ultimate load. SWL - Safe Working Load = Briefly defined, the "safe working load" of a line is the load that can be applied without causing any kind of damage to the wire rope. Note that the safe working load is considerably less than the breaking strength. Factors of safety should always be applied when calculating maximum wire rope loading conditions. In cases of doubt, an engineer should be consulted to assess the loading and advise on suitable factors of safety to ensure that overloading cannot occur. Wire rope and strand are manufactured from high tensile, high quality AISI 316 stainless steel grade 1.4401 in fully austenitic condition to give maximum corrosion resistance. 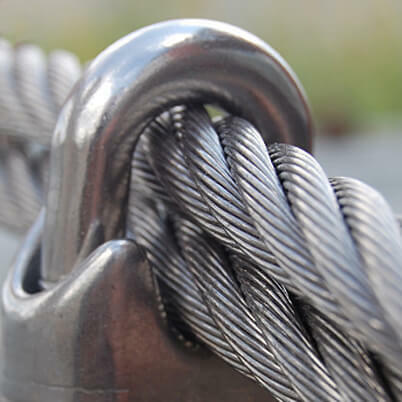 Wire rope dimensions and stainless steel tensile grades conform to BS MA 29 which stipulates tolerances on nominal diameter and minimum tensile strength for wire rope sizes and minimum breaking forces for strands and ropes. Full certification of conformance is available, please call to request this. Hi not used items as yet but feel comfortable that there will not be any problem, many thanks. Kind Regards, Neil Davies. Exactly as is says on the tin! 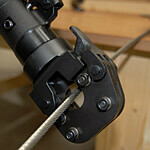 Excellent for logan berry support wire, easy to work with and attach wire clamps to. good quality product and well packaged. Website easy to use to select everything needed. Prompt delivery and good quality products. The ballistrade wire eas exactly what I expected and works well. The wire I ordered was well described and exactly what I wanted. Quality and easy to work with to make up/repair auto window regulator. Good product, was exactly as described. Quality product cut to the correct length and supplied quickly. So far, seems to be OK. Have used it for an electric slug fence fitted with stainless steel staples around plant holders. 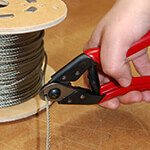 Galvanised wire was rusting, but this stainless steel wire is so far rust free. The product was exactly as I expected. I was pleased to be able to buy just a few meters. Good quality quita a large minimum bend radius. Just what I wanted. Great quality material. Hand Held Wire Cutters suitable for cutting stainless steel wire efficiently and neatly. Hydraulic Wire Rope Cutters designed for cutting stainless steel wire up to 32mm. 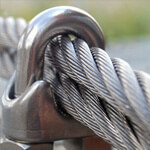 Wire Rope Grips and Clips suitable for use with stainless steel wire rope.